There is a $65 non-refundable, deposit/enrollment fee that covers pre-screening, comprehensive evaluation and needs assessment. Click here for Enrollment Application. Health and Wellness Programs are designed for members needing additional staff assistance with mobility, toileting/incontinent care, meals, health monitoring or concerns due to disease related behaviors, such as anxiety, wandering, rummaging. 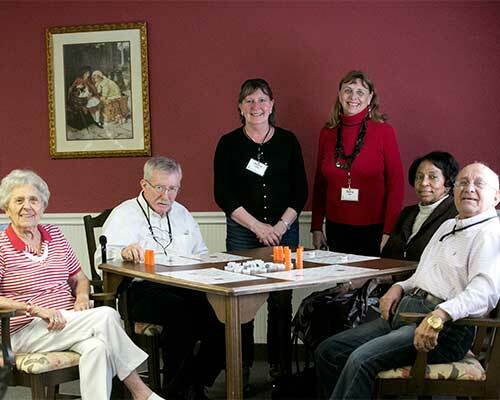 Assistance is provided as indicated by the level of care assessment form in addition to all of the same services included with the Life Enrichment Program. Other financial aid may be available for those families who qualify through local Agency on Aging or the Veteran’s Administration Aid and Attendance. The center is also closed the week between Christmas Day and New Year’s Day to allow our staff to spend time with their families. Please check with center for exact dates of closure.